Around the world, many countries are experiencing severe infrastructure needs, owing to growing populations, economic growth, increasing urbanization and ageing legacy assets. While demands are skyrocketing, supply is impeded by various factors, resulting in a global investment gap of about US$ 1 trillion per year. To bridge the gap, most governments emphasize constructing new assets, but this strategy is not a “silver-bullet” solution; after all, public-budget constraints exist, as do multiple difficulties in getting projects from idea to implementation in a reasonable time frame. A complementary and potentially more cost-effective approach is to improve the utilization, efficiency and longevity of the existing infrastructure stock – in short, to make the most of existing assets by means of optimal O&M. In reality, many governments in both developed and developing countries neglect their existing assets, and current O&M practices are often seriously deficient. 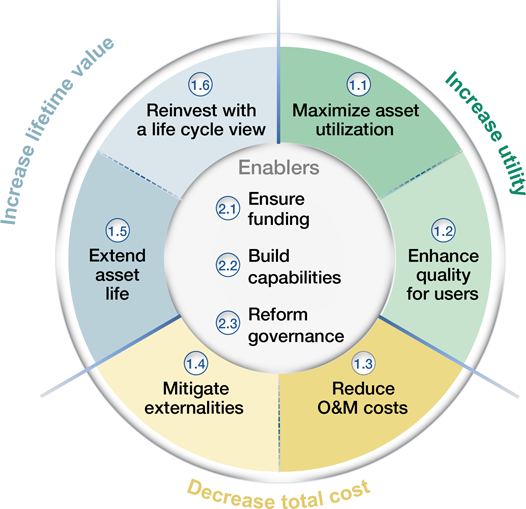 In operations, they fail to maximize asset utilization and to meet adequate user quality standards, while incurring needlessly high costs as well as environmental and social externalities. Maintenance is all too often neglected, since political bias is towards funding new assets. Similarly, resilience to natural disasters tends to be ignored, although such hazards are becoming more common and more destructive because of climate change. As a result of the maintenance backlog and the lack of resilience measures, existing assets deteriorate much faster than necessary, shortening their useful life. A proper solution will require a step change in infrastructure asset management. In fact, such a transformation is feasible. Many examples of O&M best practices exist from the various infrastructure sectors (e.g. airport, port, road, electricity) and other heavy industries around the world – they just need to be adopted more widely. And thanks to recent innovations in digital technologies, such as remote sensing, advanced analytics, autonomous operations, and integrated scheduling and control, traditional “bricks” infrastructure can now be used more effectively, and operated and maintained more efficiently. Most important of all, O&M solutions are affordable. They are highly cost-effective in an otherwise capital-intensive industry. Even small O&M improvements can make a remarkable impact, given the large size of the global asset base, where each per cent of improvement translates into billions of dollars saved. And in addition to generating financial savings, O&M improvements can also bring considerable social and environmental benefits, in line with governments’ public-service mission. 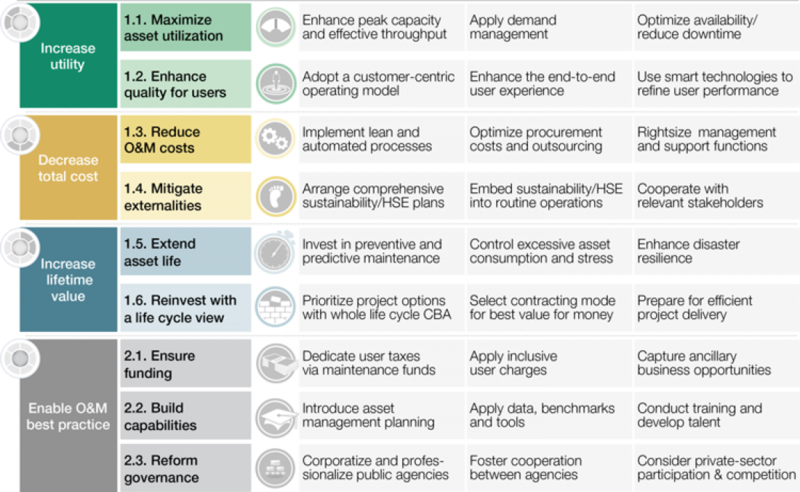 This report, developed by the World Economic Forum’s Strategic Infrastructure Initiative and its Partners, outlines government best practices for operating and maintaining existing infrastructure assets and is illustrated with more than 200 real-life examples. It follows the initiative’s previous two reports, which outlined best practices for efficiently and effectively delivering new assets by identifying and prioritizing projects in an integrated infrastructure plan (Phase I) and preparing bankable public-private partnership (PPP) projects (Phase II). For each of the best practice areas, the report identifies the critical success factors that governments and operators should take into consideration (Figure 2). While many governments and operators already apply some of these levers, they often neglect to consider all the levers systematically, and so fail to reap the full optimization potential. By assessing their country’s or asset’s maturity in each critical success factor, and the relevance of that factor to the specific context, governments and operators can use this checklist to identify and prioritize the areas where change is required. 1.1 Maximize asset utilization. Given the challenge of congestion and public financial constraints (and sometimes space constraints) on building new assets, governments should aim to maximize the utilization of their existing assets. First, they can increase peak throughput by unlocking backup capacity (e.g. hard shoulder running, reversible lanes on highways), making targeted capacity enhancement at bottlenecks (e.g. adding lanes or introducing e-tolling) and encouraging users to utilize the full system capacity (e.g. introducing high-occupancy lanes). Even within the existing capacity, however, various measures are available to increase throughput. In transport, headways between vehicles can be reduced, for example, by advanced road traffic management and next-generation rail or air traffic control systems. For electricity and water, operators can reduce physical losses by harnessing leakage detection technology, properly maintaining and repairing networks, and investing in new equipment. Concerted action on all these levers can make a large impact. Manila Water of the Philippines, for example, drove its non-revenue water ratio down from 63% in 1997 to just 11% in 2010. Moreover, the water needs of 200 million people could be met if the 45 million cubic metres of water lost through physical leakage every day in the developing world could be retained. To address the problem of congestion, operators should also pursue demand-side measures, and redistribute demand in time, space or mode. Demand-side measures are typically implemented via time-based user charges, which give users a powerful incentive to modify their behaviour. For example, Singapore’s urban road pricing scheme reduced peak traffic by about 15%, and prompted a modal shift towards public transport. In addition, operators should educate the public and provide them with the information to enable wiser decisions on infrastructure usage. Another important impediment to optimized asset utilization is downtime. In the United States (US), power outages cost the economy US$ 150 billion annually. Operators can address this problem through various strategies to optimize availability: refining maintenance and outage processes; improving incident management; and integrating operations planning with maintenance planning. Autostrade per l’Italia, for example, schedules short-duration maintenance tasks for off-peak hours, and has broadly re-engineered its maintenance processes for bridges and viaducts. As a result, the proportion of maintenance tasks causing medium or severe traffic interference has fallen from 50% to 10%. 1.2 Enhance quality for users. Historically, because infrastructure users have not been a high priority for many public operators, service levels have often been inadequate. To consistently improve quality for users, operators should adopt a customer-centric operating model: they could apply many of the techniques pioneered in consumer industries, including customer research, customer segmentation and willingness-to-pay analysis. The best operators not only address the basic user requirements, but also strive to create a positive end-to-end user experience. They excel in ancillary services by holistically addressing all customer needs. Singapore Changi Airport, for example, optimizes the passenger stopover experience through relaxation, entertainment and sightseeing offers. The best operators also make the best of the whole network’s performance by partnering with infrastructure users, adjacent assets or government agencies to provide integrated and seamless services. Some port operators, for instance, cooperate with shipping lines to make optimal schedules and reduce waiting times; with adjacent rail operators to optimize hinterland connectivity; and with government agencies to speed the flow of trade-related documentation. Lastly, the best operators also adopt smart technologies, which now increasingly provide win-win solutions that simultaneously enhance user performance and reduce costs. For example, after a wide roll-out of smart electricity meters in Sweden, customer complaints about invoicing have dropped by 60%, while the costs of meter-reading have fallen by 70%. 1.3 Reduce O&M costs. Active cost management, often neglected in the past, is becoming increasingly important owing to public budget constraints. Operators can reduce waste using a broader application of lean principles to revamp existing O&M processes. In addition, they can greatly reduce operating expenditures by systemically using new technologies, in areas such as remote asset inspection, autonomous operations, and integrated scheduling and system control. Yorkshire Water, for example, integrated and digitized all previously paper-based data into a single, real-time information system to sharpen its work scheduling and routeing, enable dynamic task allocation and ensure availability of information to all field workers and external contractors; this resulted in a 50% reduction of unnecessary field jobs. Procurement costs can be reduced by 5-15% by applying technical levers such as standardization, in addition to the conventional commercial and process levers. In areas where the requisite technology is discouragingly expensive or where specialist skills would be needed, operators can opt to outsource maintenance works or information technology (IT) services, and thereby realize major cost savings. Performance-based outsourcing contracts (with financial rewards for contractors achieving the stipulated performance targets) have reduced the cost of service provision by 10-40%. Finally, many operators with legacy organizations need to adjust their overheads and organizational structures, for example by delayering, introducing shared services and optimizing the level of (de-)centralization. 1.4 Mitigate externalities. Infrastructure operators are increasingly subject to more regulation and public scrutiny regarding their environmental and social impact. To respond to these challenges, they should craft a comprehensive programme of sustainability measures, based on the theme “Reduce, Recycle, Replace”. For example, modern wastewater treatment plants can change from being net energy consumers to net energy producers by using methane from waste-to-power generators. Ideally, sustainable practices should be deeply embedded in everyday operations by making sustainability a top-management responsibility; engaging the broader workforce and not just creating a sustainability department; and measuring and improving sustainability just as any other business process. In the US, the Metropolitan Transportation Authority (MTA) Metro-North Railroad made safety a line management priority, improved processes after analysing hazards, and increased communication and audits on safety – with the result that lost-time injuries declined by 60% within a few years. Operators should also take a multistakeholder engagement approach, actively communicating with communities in outreach campaigns and collaborating with fellow operators and users to generate a greater positive impact across the infrastructure system. Fully implementing next-generation air traffic management, which could reduce aviation carbon-dioxide (CO2) emissions by 4% by 2020, requires enhanced cooperation between the various participants in the aviation value chain. 1.5 Extend asset life. Once a costly infrastructure asset has been built, every additional year of lifetime provides huge value, as the marginal costs of operations are relatively low. Clearly, operators should invest in preventive and predictive maintenance, which is increasingly facilitated by remote condition monitoring and advanced asset deterioration modelling. Some new bridges now have wireless sensors that continuously monitor and report the asset’s condition, enabling predictions of the remaining useful life and optimizing maintenance routines. Any maintenance strategy will require close cooperation across different, often siloed departments, and will need to be customized to the specific asset context and based on a proper assessment of the vulnerability and criticality of each piece of equipment. Developing such customized and innovative maintenance treatments can have a major impact; for example, the asphalt-preserving surface coating applied to the M25 motorway in the United Kingdom (UK) increased the pavement’s life by a third. Another crucial factor in extending lifetime is the adequate management of the asset, according to its specifications, to control excessive usage or consumption (e.g. regulating the use of heavy trucks on rural roads). A further major risk to infrastructure is natural disasters. The economic losses caused by storms, flooding and earthquakes worldwide over the past 30 years are estimated at US$ 3.5 trillion, and these hazards are becoming more common and more destructive because of climate change. To address this, governments must identify and assess those risks, develop cross-sectoral master plans and incorporate more resilience into existing assets. Their efforts should focus not only on structural measures, such as building protective barriers and retrofitting existing facilities, but also on cost-effective, non-structural measures, including the creation of natural buffer zones and the adaptation of more resilient design codes for future reconstructions and upgrades. 1.6 Reinvest with a life cycle view. Since most of the infrastructure in developed countries was constructed from the 1950s to 1970s, many assets are approaching the end of their life cycle and need to be rehabilitated or replaced. However, before committing to major capital expenditure, governments should first identify all possible project options and investigate more cost-effective solutions, such as throughput optimization, loss reduction, demand-side measures, systemwide capacity balancing and targeted investments to debottleneck existing sites. The project should then be selected on the basis of a rigorous cost-benefit analysis, taking the whole life cycle into account. In many cases, the life cycle analysis will reveal that the long-term costs of O&M are actually much greater than the initial costs of construction. The life cycle cost analysis thus needs to be performed early on and in the specific asset context, as the majority of life cycle costs can still be influenced through shrewd design and engineering decisions, such as whether to use concrete or asphalt for paving a road. After committing to the project, the most efficient delivery mode – public sector, PPP or private sector – should be chosen on the basis of a value-for-money assessment, taking into account the potential quality of service and level of risk to the government budget. For example, the new hospital in Tlalnepantla, Mexico was delivered as a PPP, realizing whole life-cycle savings of 30% relative to the projected costs of traditional public delivery, as well as producing a “greener” infrastructure facility with energy savings estimated at 20%. In addition to implementing O&M best practices, governments also need to create the right conditions for optimizing O&M for the long term. They need to ensure funding, build capabilities and reform governance. 2.1 Ensure funding. A typical source of funding for O&M requirements is annual appropriations from the government budget. However, these are vulnerable to political expediency and so are often ill-suited to O&M, which requires a very predictable and sustainable source of funding. More suitable models include dedicated maintenance funds that earmark and ring-fence user taxes, user-charge models and revenues from ancillary businesses. As examples of dedicated maintenance funds, the Swiss and Austrian road funds provide reliable sources of funding that are decoupled from the annual public budget. But such funds face their own set of challenges in many countries: the increasing fuel efficiency of cars (and their future replacement by e-cars), as well as flat fuel tax rates, erode the funds’ financial base. It is thus essential to link their revenues to inflation and actual traffic volumes. A broader adoption of user charges is also warranted, as they can more easily link funding to inflation and traffic volumes. User charge models not only ensure a dedicated funding contribution from each user, but also encourage customers to use the available capacity responsibly and sparingly. Introducing or increasing user charges requires a sophisticated stakeholder communication strategy, and a delicate balancing of financial and economic objectives as well as social considerations. Perhaps the best approach is to correlate new user charges with quality improvements on the one hand, and to provide targeted tariff reductions or alternative infrastructure on the other. Finally, ancillary business opportunities can generously supplement the funding of the core infrastructure business; for example, best practice airports can realize more than 50% of their revenues from retail, hotels, advertising and parking. 2.2 Build capabilities. In many countries, the key constraint to implementing all of these O&M best practices is the shortage of skilled staff. One priority is to increase formal O&M education and training in the various disciplines by academia, international financial institutions (IFIs), governments and the private sector, and to enhance other forms of knowledge exchange. Actually, the O&M phase itself is an excellent learning environment, as its stability and long-term orientation enable uninterrupted learning curves over a project’s life cycle. While such skill education and training is essential, it is not sufficient. Governments need to do more to attract high-quality O&M managers and planners, and to develop and retain them for the long term. Sustainable O&M performance is compromised not just by the shortage of individual capabilities, but also by the common lack of institutional capabilities. When making their infrastructure plans, governments need to ensure that O&M projects are prioritized in an integrated cost-benefit framework, alongside greenfield projects; and, to ensure the continuity of the maintenance programme beyond election cycles. Governments should conduct regular assessments of the existing asset base, and create an infrastructure balance sheet to show how the stock of assets has evolved and to forecast the required maintenance funding. Governments should also introduce standardized infrastructure asset management processes and frameworks (such as ISO 55000), and make full use of data, benchmarking and modelling for optimizing O&M procedures and expenditures. The North-West Transit Way near Sydney, Australia provides a good example of what can be achieved by applying such data-driven decision-making. By using a sophisticated pavement-modelling tool based on highly granular data, the contractors were able to home in on an optimal whole life-cycle solution with cost savings of 15%, while still ensuring road availability of 99%. 2.3 Reform governance. Governments have to deal not only with legacy assets, but also with legacy organizations and cultures. The right governance model is a crucial factor in motivating agencies and their staff to optimize O&M. One approach is corporatization of public agencies; it often captures the advantages of a privately run company, including enhanced productivity, streamlined processes, commercial orientation and financial sustainability, while remaining accountable to the public and serving the public interest. When the Aqaba Water company in Jordan was corporatized, the outcome was a 30% sales increase, a renewal of 90% of the network, performance improvements, increased employee training and enhanced customer service. Improvements are needed not just to individual agencies, but also to coordination across sectors, government levels and even borders. Finally, additional private participation could enhance infrastructure O&M by tapping the private sector’s skills in managing infrastructure assets. In water treatment, some major US cities have recorded savings of over 30% in operating costs. Given the current strong interest of private institutional investors in low-risk, long-term infrastructure investments, governments may consider granting concessions or selling some assets on favourable terms and recycling the proceeds into new projects – but only if such transactions provide value for money to society. While many governments and operators already apply some of these O&M best practices, many others fail to achieve anything near the full optimization potential. They should begin by systematically reviewing and benchmarking their O&M practices and policies against the complete best practice checklist (Figure 2). After identifying the most critical issues in a country’s and sector’s particular context, governments will need to establish a broad action plan. While inevitably some trade-offs will have to be made when crafting it, governments should always try to find win-win solutions; these are increasingly available now, thanks to new technologies and process innovations. Many of the implementation best practices can provide quick fixes, and are essential for short-term efficiency improvements that can unlock funds for larger transformations. However, governments should treat O&M not only as an operational necessity aimed at reducing costs, but also as a strategic element that optimizes the value of an infrastructure asset for society – by increasing the asset’s utilization, availability and service levels. In the long term, a sustainable O&M solution will inevitably require the right enablers in place, secured and stable funding, managerial and technical capabilities, and the right governance structure. Excellence in infrastructure O&M is a key means of narrowing the global infrastructure gap – but it is no panacea. Most countries will still need to construct new assets and address vast infrastructure deficiencies. Still, by optimizing existing capacity utilization, O&M best practice can significantly reduce the amount of new construction and, by optimizing operating costs, can also make financial resources available for whatever new construction is truly needed. Of course, it can also ease current congestion far faster than new construction could. Well-designed O&M strategies and policies, in conjunction with policies to improve the earlier phases of infrastructure projects (planning, preparation, procurement and construction), can benefit developed and developing countries immensely. They will thus have the opportunity to boost their infrastructure services, strengthen their competitiveness and foster socio-economic progress and prosperity.